It’s currently playing to sell-out audiences in London’s West End but Scottish fans won’t have to travel that far to enjoy the delights of 9-5 The Musical! Aberdeen Performing Arts announced today the hit show is coming to the city’s HMT this October. The cast list hasn’t been announced yet but the show will feature the iconic film’s original screenwriter and an original Oscar, Grammy and Tony award‐nominated score by country legend and pop icon Dolly Parton. The show tells the story of Doralee, Violet and Judy ‐ three workmates pushed to boiling point by their sexist and egotistical boss. Commenting on the tour announcement, Dolly Parton said: “I am beyond thrilled to the response from across the pond to 9 to 5 The Musical. The overwhelmingly positive fan reaction to this universal story tickles every rhinestone on my body! I can’t wait for more people throughout the UK and Ireland to enjoy it and sing along”. 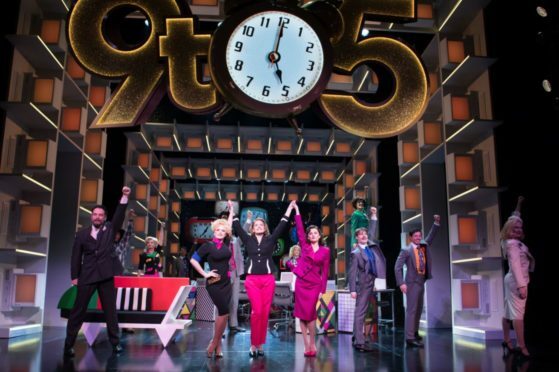 9 to 5 the Musical will be at His Majesty’s Theatre from Tuesday, October 22, until Saturday, October 26. Tickets go on general sale on Friday, March 22, and are available from www.aberdeenperformingarts.com , in person at the box office at His Majesty’s Theatre, Music Hall or Lemon Tree, or phone (01224) 641122.